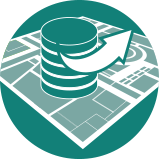 Use spatial data from governmental sources or Open Street Map (OSM) for your base map. Set scale and choose a coordinate system, georeference non-referenced old digital maps or scanned paper maps. Import spatial information data such as shapefiles, DXF files or OSM data. Use the database manager to select data. Build up connections to various WMS providers to use WMS as background maps. Run XML scripts for faster and automated import. 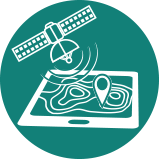 Enrich your map by capturing map features yourself using GPS, laser range finder and analyzing digital elevation models (DEM) or LiDAR data. Use the step-by-step wizard for LiDAR data and DEM to derive easily – and within a single run – hill shadings, contour lines, vegetation height maps and much more. Run OCAD on a Windows tablet PC to update your map in the field. Receive real time GPS signals to capture map features precisely on your map. Capture map features on the spot with a laser range finder. Assign your data to your own unique map symbols. Use the unique drawing, editing and generalization tools to produce maps for the most demanding requirements in cartography. The sophisticated symbol editor enables you to create any map symbol you could imagine. Alternatively, simply use one of the predefined symbol sets. OCAD attaches great importance to precise and efficient drawing. «Bézier curve mode», line tracing and snapping mode are just some among many other specific map drawing tools. A huge number of editing functions makes updating maps most efficient, like reshape, crop objects, virtual gap or interpolate. Use generalization tools to make your map most legible, like line smoothing or the generalization of area objects. 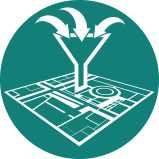 Benefit from the symbol status manager to derive different types of maps within the same map project. Finalize your map with a layout for printing, export for further digital use or create an interactive web map version. Add automatically generated map legends and coordinate grids. Add peripheral map information such as the title of the map, scale bars or logos. Export your map in various (georeferenced) raster and vector formats, e.g. for further use in GIS software. Print your map in either spot colors or process colors (CMYK). Create an interactive OCAD Internet Map (OIM) based on Open Layers with just a few clicks. Place your map as a KML file over WMS or Earth Viewer, such as Google Maps and Bing Maps. Run XML scripts for faster and automated export. Alter your map features in different representations without affecting your original map. However, if you change the original, the different representations will adopt these changes. 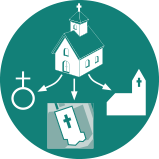 Add a representation to insert additional objects and/or remove others. Add a representation to translate texts objects to a different language. Add a representation to shift objects to fit them into a certain print extract (e.g. map edge cleaning). 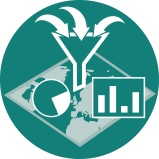 Visualize your statistical data with the Thematic Mapper. A step-by-step wizard assists you to get spatial overview of a specific theme or subject area. Choose between different representations like proportional symbols, lines and arrows as well as choropleths or various types of charts such as bar charts, pie charts and wing charts. Map objects can be individually placed, displayed or hidden. 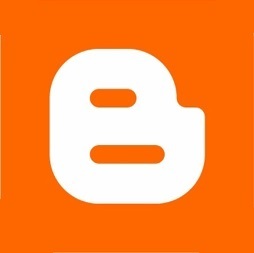 Easily automated with XML scripts. 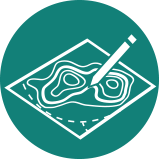 Combine thematic maps seamlessly with topographic maps.